The Richfield Oil Building (or Richfield Tower) was located at Flower and 6th Street in Los Angeles, CA and was completed in 1929. This building was designed by Morgan, Walls & Clements and stood 372 feet tall with 12 floors. The Richfield Tower was demolished in 1969 to make way for the ARCO Plaza. 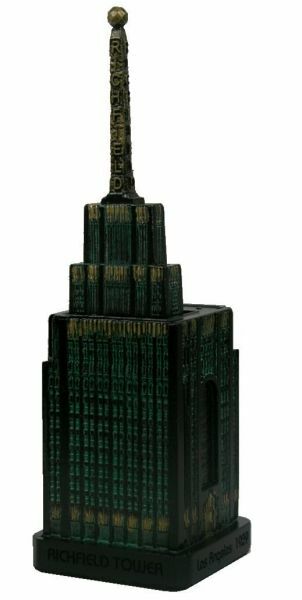 This pewter replica stands 6-1/2 inches tall and is finished in black with a green stain and gold highlights. While the other replicas I bought from you were beautiful, the Richfield Building is exquisite! I ordered it with color highlights as shown on the website and that makes this replica even better, matching the black and gold of the original building. Its too bad this beautiful building was demolished! Very happy to have this in my collection. My first model with InfocusTech and am very pleased. Well made and beautifully crafted. Looking forward to many more purchases.